Alber Viamobil Eco V14 Wheelchair Power Pack. 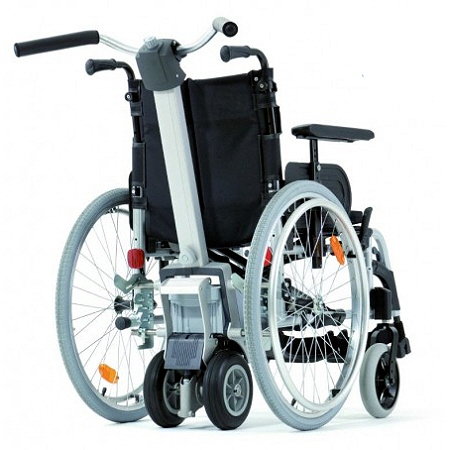 Alber Viamobil Eco V14 Wheelchair Power Pack - The new easy way to push. Viamobil eco is also a safe partner when traveling downhill, with the automatic braking function providing a big advantage in safety. The intelligent spring system ensures a comfortable and quiet ride, automatically compensating for bumps or dips in the road surface, making sure the wheel always remains in contact with the ground. These benefits not only relieve the strain on the carer, they enhance the personal freedom of carer and user alike and thereby improve the opportunity for social contact. ErgoDrive means easy and convenient operation. The ergono- mic handlebar control gives the attendant easy control in any situation by pressing the handles down to go forward or lifting up to go in reverse. The drive lever on the ergonomically shaped control unit is simply depressed slightly using the thumb to move the wheel- chair forwards. This means that even longer walks can be completed without fatigue. The drive lever is lifted up to go into reverse. The advantages of both control options. All functions are controlled using a hand wheel with one hand for optimum ease of use. Intelligent pneumatic spring system that adapts to bumps and dips in the ground. 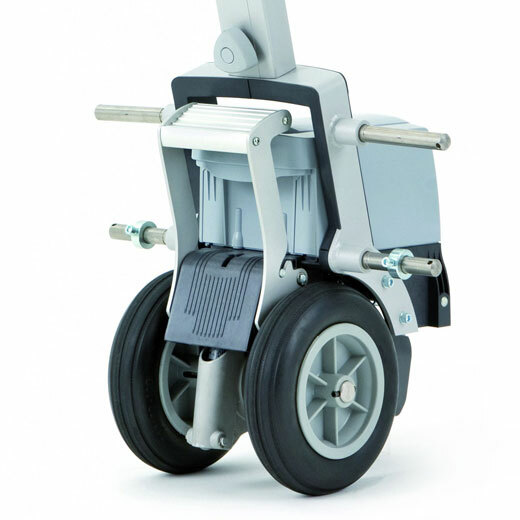 Foot pedal for conveniently lowering and raising the drive wheels, for instance, when manoeuvring indoors without any assistance from viamobil. In a matter of seconds, viamobil eco dismantles into three handy parts, without tools, and easily fits any car boot or luggage compartment. 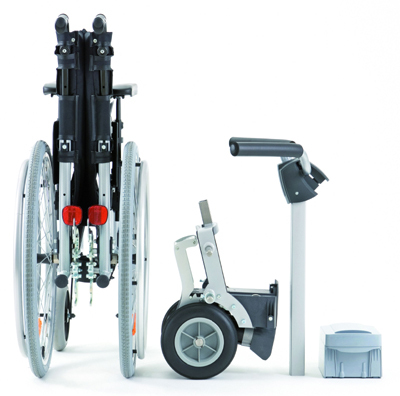 Viamobil eco combines with most standard wheelchairs and, thanks to its well designed coupling system, attaches easily to the wheelchair without the need for tools. Prior to ordering please contact our customer services team on 01642 805050 or enq@activemobility.co.uk to give us details of the wheelchair that you are fitting the Viamobil to. For driving up slopes with gradient steeper than 8%. Removable using the quick-release fasteners. Recommended for heavy wheelchair users. Battery pack can be charged in the car during travel. Display with indication of charging status. Input 12 V – 32 V.